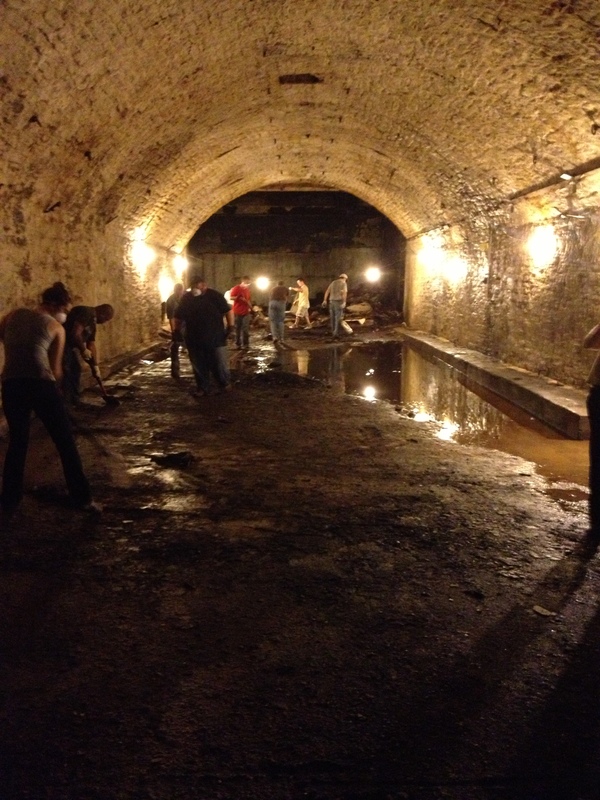 After being sealed 18 years ago, an entrance to the Hudepohl lagering tunnels has been reopened by the hard working Over-The-Rhine Brewery District team! How does a massive underground structure get lost for 18 years you ask? Well, being underground is a good start to hiding things, then deciding that it wasn’t useful space and pouring concrete over it also helps. Having the area of town, it’s in degrade from German village to violent ghetto also assists in that. Luckily there are some hard working detectives at the OTR Brewery District who talked to the owners of the former Hudepohl bottling plant, and some of them were still around who remember back when this was sealed up. After getting some approvals and paperwork signed the Brewery District group started swinging a sledgehammer earlier this month! If I had a hammer… I’d hammer into a lagering tunnel!! The tunnels were originally used by the old Hudepohl brewery to lager their beers at the cool 58.6 degrees Fahrenheit provided by 30 to 40 feet of earth. Hudepohl survived the market consolidation in the 60s better than most, in fact, they ate up some brands like Burger. Seemingly boosted by the initial success of Moerlein Select Lager in 81 the rest of the decade didn’t fare so well, and they combined with Schoenling in 1986. 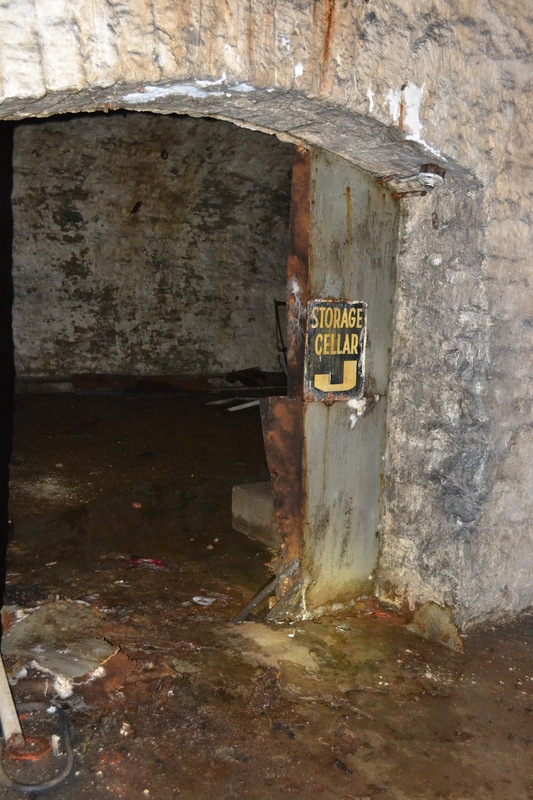 With the combination of brewing facilities – and eventual sale of those facilities to Boston Beer Company – these tunnels fell into disuse and were sealed up around 1997. Thanks to Steve Hampton for the photos! 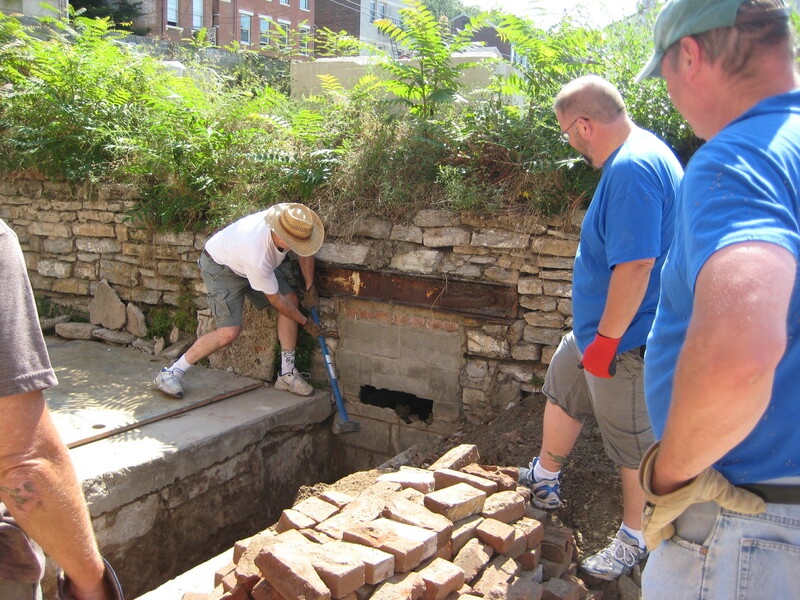 This reopening brings Cincinnati up to a total of 7 rediscovered lagering tunnels, 6 of which you can see on various tours offered by different companies. The soonest anyone can see these new tunnels will be on the Marzen Tour next weekend. You also get tours of the Jackson Brewery, and it’s lagering tunnels which plunge into the Clifton hillside before finishing up with a tour of Christian Moerlein’s new production brewery and a beer there! I consider these tunnels to be one of the real gems of Cincinnati brewing history. They’re something unique that can’t be experienced most anywhere else in the United States. If you’ve only got a few hours to spend in Cincinnati, like over Oktoberfest weekend, or you’ve lived here your whole life, you should check these out. It doesn’t hurt that almost all the tours of these include a beer! Lager tunnels are the coolest tunnels around. Put them back into use! I can’t find it now but within the past month I saw someone trying to put the gerke tunnel back to use as a home brew lagering area. Pingback: Help Fund Ghost Breweries Documentary!